Humans have a major impact on the natural world, and the need to solve environmental issues with sustainable solutions has never been more urgent. Through UNC Asheville’s liberal arts lens, environmental studies provides an examination of our imprint on the planet across many fields, including biology, geology, chemistry, economics, public policy, and other natural and social sciences. 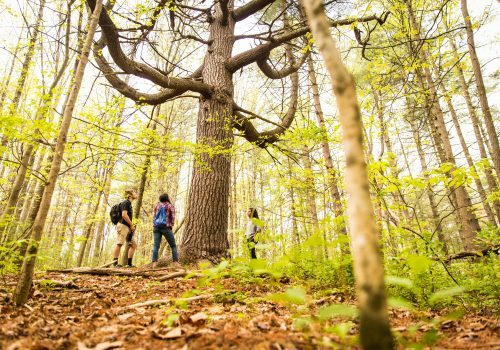 UNC Asheville’s location in the Blue Ridge Mountains puts over a million acres of biodiverse forest at your fingertips and hands-on learning is at the heart of the Environmental Studies Program. Internships are built into the curriculum, and through the McCullough Fellowship, qualifying students can receive funding to conduct sustainability research in Asheville. Students passionate about leading environmental stewardship efforts can join our Student Environmental Center. The Environmental Studies Program at UNC Asheville prepares students for graduate studies or for employment in government, education, industry, consulting, and nonprofit organizations. For 15 consecutive years, the environmental studies program has been named to the list of pre-professional programs with exceptional strength in preparing students for careers by The Fiske Guide to Colleges. Visit envr.unca.edu for departmental news and updates.